Anyone who has been to a British university in the last two decades will know what “lad culture” looks like: heavy drinking, raucous chanting, and an inscrutable obsession with vomit. All feature prominently in Maisie Brooker’s ‘Shanter’ (i.e. “s*** banter”), and for the first half of the play the “banter” barely lets up. Yet the play’s attempts at humour often undermine Brooker’s more serious point: just how toxic this culture can be to the young and vulnerable. Directed by Joshua Elliott, the story takes place at a music festival, and hinges on the reunion of three childhood friends, Amber (Maisie Brooker), Hamish (Cameron Fraser), and Sam (Eden Stewart), one year after leaving school. As the revelry gets underway, they are joined by two characters from their past: the painfully naïve Berty -whose induction into a toxic group of “lads” at university disturbs the others, and later the mysterious Noah (Conor Delaney), from whom no-one has heard a thing in two years. The staging is simple but effective: a handful of tents and camp chairs in the centre of the room. The small size of the venue is worked to the play’s advantage; huddled in close, we feel as though we’re in neighbouring tents, eavesdropping on the action as it unfolds. In fact, the actors should trust this intimacy more; their decision to chatter now and then with the audience feels forced, and rather than increasing our sense of immersion has the opposite effect. The structure of the piece is tight, and Brooker clearly has a good sense of pace. However, the story itself is clunky, and details often seem superficial, designed to fulfil plot progression rather than explore themes or characters. Noah’s prolonged absence, the factor which drives much of the action, is never really explained, and a rekindled relationship between he and Amber feels both artificial and predictable. In fact, Noah’s entire story makes little sense, and the seeming lack of motivation for his actions makes him appear more plot device than character. The most engaging story by far is Berty’s, as he clings to the idea of being “one of the lads”. Having been effectively bullied both by Noah at school and by his new university “friends”, Berty seems desperate to live up to their appalling examples, too naïve to see that it’s destroying him. And yet this too is almost derailed by awkward attempts at comedy as the tragedy deepens. The “banter” that is tearing Berty apart is only marginally more unsavoury than that of Amber, Hamish, and Sam themselves. This would be fine were they oblivious to his problems but feels incongruous given their genuine concern at what he has become. Despite the story’s shortcomings, a handful of genuinely engaging performances keep the show alive. 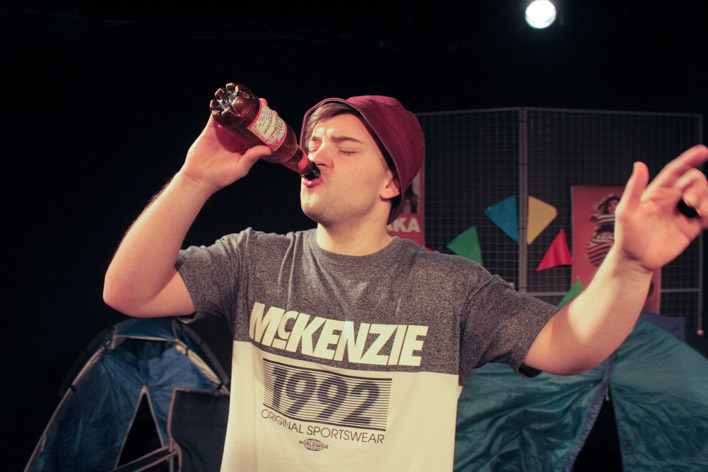 Jordan Clarke, in particular, perfectly captures Berty’s faltering bravado and the excruciating tension at its heart. The tightly rehearsed set pieces, careful handling of the subject matter, and a few genuine laughs early on demonstrate a highly talented young cast. In this case, it is the players rather than the play which excites.